Well we have been off line for some time and many readers will want to know why this is. Interest levels have been excellent, and we feel that we needed a breather to evaluate where we are and how we need to best proceed going forward. The Top Ten Performance car series will restart with the Gordini article later this week and we have solid follow ups regularly thereafter and we are sure you will be intrigued by what is to come. 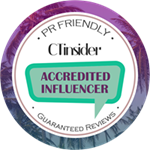 We will be kicking off today with a new venture altogether and that is providing our user base with articles that will be of interest and value covering products and services available in the industry. 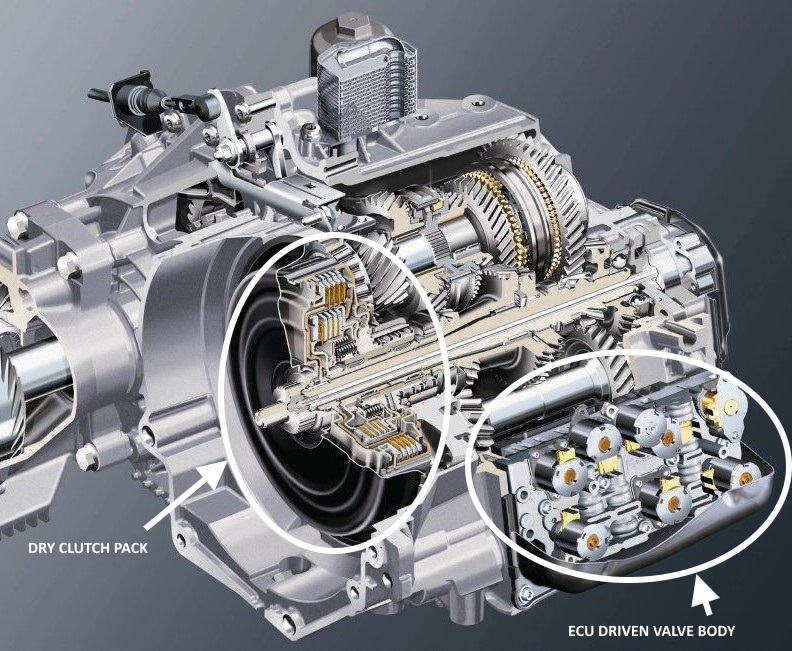 First off will be an article on Transmission Oils and the servicing of high-tech gearboxes. We are selecting key areas of vehicle operation affecting owners and will bring useful information to the fore across the spectrum as these come to our attention. The new venture will not be an advertising programme…all products and services finding their way onto our pages will be evaluated thoroughly to ensure, to the best of our ability, that these provide real value to prospective customers. We live in a world of chance and whilst we acknowledge that most folk try to do a good job of what they are doing, vehicle issues are becoming horrendously expensive and the consequences of less than ideal products and services are massive. On the plus side there are people out there who are providing excellent value…we want to bring those operations and products to these pages …so hang on to your hats because amongst the clutter there is awesome stuff out there. Last week I had the pleasure of being involved with a Company providing a solution to a problem most of us do not know we have. Motul South Africa are in the process of launching an efficient oil servicing system designed to carry out oil changes effectively on modern vehicle transmissions, giving both vehicle owners and service agents a sound value proposition. The key to this is the automatic purging capability of the system being able to remove 95% of the old oil and associated contaminants effectively…something not being done very well in the industry at present… but sorely needed in the new world of multi gear automatic transmissions. Why is this important?…well because I have watched the rapid rise of transmission related failures over the last number of years and what is needed is some clarity, firstly by bringing facts to the table on a subject that has been concerning me for some time and then to offer a solution able to head off a large portion of future failures. Please read on…. Over the years we have watched the car servicing industry change massively, shifting from owner-based responsibility with direct payment to service providers by owners even under a new vehicle warranty, to the modern-day Service plans built into the purchase of a car. Along with that has come a certain blurring of that line of responsibility and in addition to not being too sure of the value afforded in these processes, when vehicles leave the warmth and comfort of the service plan, many folk question the need for the full servicing package as laid out by the manufacturers thereafter. One thing is cast in stone however and that is that if you have any intention of keeping a vehicle for a fair period of time after the service plan or if you purchase a used vehicle at that critical point… beware. I say this because if you are in the mindset of conventional wisdom which considers an engine oil change as the ‘driver’ of servicing musts and schedules…which I agree is important…you need, particularly in the light of new technology, to consider an activity just as critical and that is gearbox oil servicing. Whilst I do not have comparative statistics to prove my next comment, involvement in the tech side of the industry at manufacturer engineering level over many years can attest to the fact that South Africa has one of the highest, if not the highest, attrition rates in vehicle mechanical failures anywhere in the world. Believe it or not, the reason for this is straightforward… no other country has the combination of High Altitude, High Temperatures and sustained High speeds affecting the majority of vehicles on the roads. When you add to that the very loose traffic policing, just ask the question… where else in the world, for example as happens over our December holiday period, do you see cars and pick-ups towing boats, caravans and trailers in temperatures of between 35 & 40C at sustained high speeds (some up to 140Km/h) for long distances? A 1000Km trip in a day for a South African is a walk in the park. Over the years, I have repeatedly had the experience of working with source plant engineers (from Japan/Germany) requesting design upgrades to improve reliability on all manner of issues affecting product locally. The sequence is always the same. The engineers arrive, spend about a week or so gathering data with you and initially at any rate work out that because the particular problem only occurs at a high incidence in South Africa …the fault must be with the local activity…and that is where the initial investigation is normally focused. It is probably on the second visit by these engineers or when all avenues of possible local blame are exhausted that the penny drops and the engineers concerned realise the severity and or uniqueness of our operating conditions…Only then are design changes introduced or field campaigns initiated to upgrade customer vehicles. I call the sequence ‘obfuscating the obvious’. I mention this only to illustrate the fact that as a consequence of the way we drive and the conditions under which we operate, servicing is critical to the long-term well-being of our cars in this country. The arrival of multi-gear modern auto transmissions could therefore be seen as just another advance in technology with ‘service as usual’…but for those subscribing to that thinking, either as a vehicle owner or in the service and repair industry… you do so at your own risk. GEARS AND ECU DRIVEN VALVE BODY. Given that many of the design upgrades which I spoke of earlier had to do with transmission failures, we learned the critical nature of transmission oils. Oil contamination in a gearbox is something that occurs quietly and consistently and if left unchecked in modern transmissions will result in failure much earlier than we are used to with conventional manual transmissions… CVT DSG and DCT gearboxes are considerably more complex and more vulnerable to oil quality drop off. Now whilst we may think that a gearbox being a self-contained device with internal oils sealed into the unit, that there would be no chance of pollutants entering. …not so… For example, after a hard, hot days work, the innards of the ‘box cool down and condensation from the air inside the unit pollutes the oil ever so slightly. Some of it is burnt off but over time, and especially in colder humid climates, water content can eventually become sufficiently troublesome to require oil changing on that alone….but there is more. In modern multi ratio DSG gearboxes, where most run on a wet clutch system similar to that of an older type Auto Box, the clutches wear and the particulates contaminate the oil… that despite the filtration system doing its job well.. In units with Dry clutches, be they conventional manual gearboxes or some DSG units operated by external ‘dry’ clutches, the transmission gears need to be lubricated. Whilst these transmissions do not live in an environment generating particulates, there is another aspect of oil contamination that affects both these and the Wet clutch DSG’s mentioned earlier… Dust Ingress. A gearbox has a breathing system with air moving in and out due to the large variations in operating temperatures from cold through high temps and back again. In a few cases these are filtered but on most there is just a ‘breather’ which allows the air to move and, whilst the ingress is small, dust finds its way into the system over an extended period…and here is the ‘rub’…South Africa and especially the Highveld, Freestate and the Northern Cape are dusty dry areas and I have measured Silica (Glass particulates in dust) to figures greater that 40 and 50 Parts Per Million in transmission oils. 30ppm is severe enough to damage a conventional 5speed gearbox and as noted earlier this does not happen overnight but believe me, dust gets in there and when not serviced correctly wears away the mechanicals…bearings normally suffer first. The valves powered by the same oil activating those clutches. The first two are kind of… ”OK I get it”… but the third, the valving, needs a little explaining and due to oil contamination can lead to mega drama. Clean oil with minimal particulates and no gum or varnishing will keep the valves moving smoothly and these little blighters need to be kept doing that. DSG Gearbox function today is almost seamless with shifts controlled brilliantly by messages coming from the ECU telling the valves not only to move at the right time but offering the right pressure for deactivation and application depending on throttle position and rpm. Just let the valves get sticky and the smooth function disappears in a flash. Poor valve timing resulting from sticky valves at light throttle and low speeds will result in harsh banging gearshifts and at full throttle can result in slipping clutches, runaway rpm and a burnt-out transmission. My main concern is that transmission rebuilds today can be more costly than an engine overhaul and more importantly, as we will see in this piece…they are largely preventable. Before we go there however let me just touch on those Service plans which are used as sales tools by manufacturers and my next comment may draw some wrath from those folk. Firstly any Servicing documentation that talks about a lifetime oil fill for transmissions…ignore. Do not run any new transmissions beyond 80 000km in normal operation and where used in heavy duty, constant high speed or where the 80 000 km arrives beyond three years. Change the oil sooner. And in SA operating conditions if it was my car, at the 60 000Km service in a 15000km service cycle. Period. Other than that personal comment…stick to the manufacturers oil change intervals carefully. Now that we have put the frighteners up everyone, here is another warning, this on the subject of changing oils on those modern transmissions, as well as a solution to the problem. We tend again as a result of historical knowledge governing our thinking, that the method of draining the transmission manually as we are used to in engine oil changes (ie oil pan drain and filter) that the job is done…its not… because this method will at best only remove 60% of the old oil…The balance remains in the system and not a good idea at all for any mechanical device, let alone a sensitive modern transmission. Motul have solved that concern effectively with their Motul Evo Oil change programme. As you would imagine, the key to this activity is a machine which when connected to the various transmissions DSG/Auto/CVT cleverly drains the system and refills. In the process the operator is able to assess the degree of oil contamination or overheating the oil may have experienced and as a result adjust the purge cycle until the oil is clear. I attended the launch and training programmes for the new venture and was impressed by both by the function of the machine and the broad vehicle knowledge of the team. 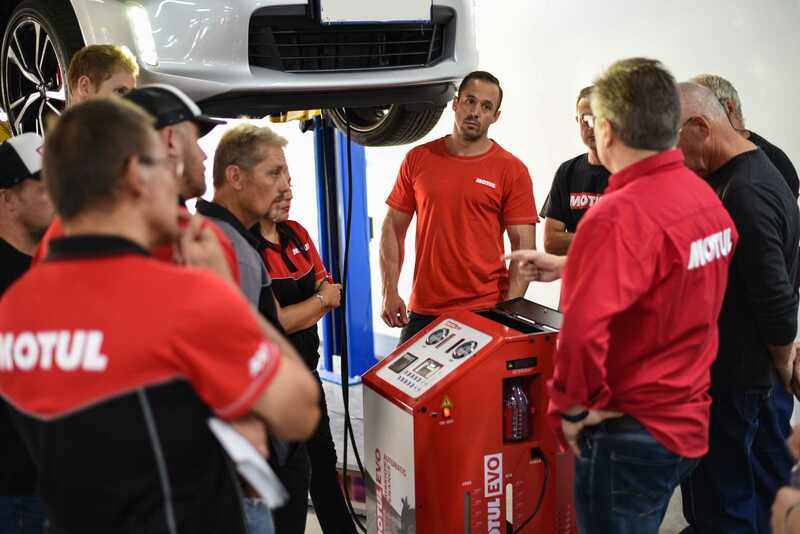 The car selected for the training was a Nissan 370Z and in no time the data for the connection was downloaded off the Motul data base, the car hooked up to its very own Motul ‘dialysis’ machine, the correct oil spec identified and the oil change conducted in minutes. Álong with the tech stuff, the Motul men are trained in the correct contact and communication with customers, conducting road tests with owners, identifying concerns prior to the service as well as a proper hand over once the job is done. SOMETHING THAT NEEDS TO BE STRESSED AND IS NATURALLY VERY WELL UNDERSTOOD BY THE MOTUL FOLK IS THE USE OF THE CORRECT OIL SPECIFICATION FOR THE VARIOUS APPLICATIONS. A/T or automatic transmission fluid (ATF) has become something of a generic term in our industry and unfortunately many believe that this is a one size fits all. There have been many transmission failures directly attributable to the incorrect selection of gearbox oils. The Motul system avoids this by clearly identifying model/transmission requirements. This makes it easy to select the correct spec from their wide selection of high grade oils. The launch of Motul’s MotulEvo automatic gearbox maintenance system has been successfully pioneered in 13 European countries and for those that take advantage of the service, the MotulEvo system is set to transform the experience of driving and servicing automatic vehicles nationwide. ATF demand in South Africa is projected to almost double by 2025 (from 2016 levels), so this is a timely entry into the market. 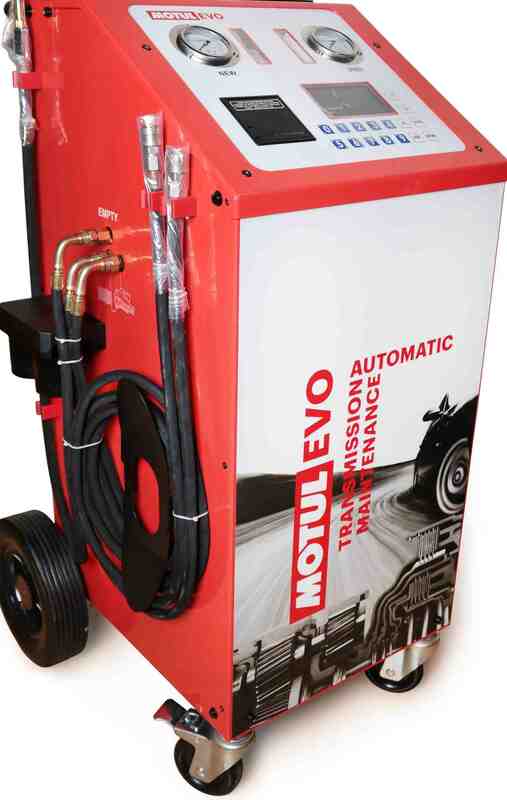 MotulEvo is not just one product, but a complete package of products and services that combine which will give the trained retailer or workshop staff the capacity to flush, analyse and change automatic transmission fluid. The Equipment and associated support systems consisting of the Flush Machine, proprietary website training for the retailer and worskshop personnel are geared to compliment the capability of any well-established servicing operation. The flush machine comes complete with all the fittings required to work on the majority of automatic transmission vehicles. The latest version is equipped with new oil analysis software and a database of ATF requirements and specifications for over 500 vehicles. Easily accessible through smart devices, the MotulEvo website is fully customisable and offers locally relevant information (thanks to geo-location technology) regarding maintenance protocols, oil and oil filters, gearboxes and identification plates. Motul go on to note that vehicle owners have historically tended to go for longer periods between gearbox servicing and extending the lubricant life. MotulEvo is designed to counteract some of the more concerning consequences experienced as a result of high levels of ATF contaminants caused by infrequent servicing. Motul have identified the major issues in transmission citing Jerking and delayed and erratic shifting which can rapidly result in the need to replace the entire transmission. Considering that all important value proposition which I mentioned earlier, this is a win-win for all concerned. Firstly, for the vehicle owner it is a genuinely necessary piece of preventative maintenance and doubles as a revenue generating opportunity for the progressive servicing agent. high-tech engine and industrial lubricants. Motul is also recognised as the specialist in synthetic lubricants. As early as 1971, Motul was the first lubricant manufacturer to pioneer the formulation of a 100% synthetic lubricant for automotive engines, the Motul 300V lubricant, which made use of ester technology derived from the aerospace industry.